The DCIC is officially launching the “dras-tic” archiving platform at iPRES 2016, today Oct. 4, 2016. The University of Maryland has concluded a significant license agreement with Archives Analytics Solutions ltd., a software development firm in the United Kingdom, for the ownership and use of its lead product, Indigo. This was developed in collaboration with the University’s Digital Curation Innovation Center (DCIC) in the College of Information Studies as the result of a $10.5 M NSF grant. 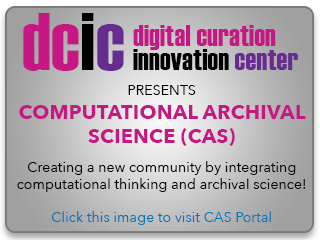 For further information about dras-tic and the computational archival science community contact Richard Marciano at marciano@umd.edu. Next Post:10/17/2016: Mapping Inequality Project is Announced!